"from The Mountains To The Prairies America Rediscovers Its ""#1 Anthem"""
September 11 2001. On the afternoon of the day America was attacked, every member of the U. S. Congress gathered on the steps of the Capitol in Washington D.C. to express solidarity with each other and with the American people. They pledged their support for the President. They vowed that America would respond, and that America would prevail. And then, someone in the group began to sing ""God Bless America."" Within moments, the entire Congress sang Irving Berlin's ode to his beloved country. (Of that impromptu performance, the Wall Street Journal's Terry Teachout would later write, ""Though I've heard it sung better, I've never heard it sound better."") In the tumultuous days and weeks that followed, ""God Bless America"" would become the song of a nation, our ""#1 anthem,"" in the words of the New York Times. When President Bush made his first visit to the still-smoldering Pentagon on September 12, he joined the workers gathered there in a rendition of ""God Bless America."" When Broadway shows resumed performances the following night after an unprecedented hiatus, most at the suggestion of The League of American Theatres & Producers replaced their traditional curtain call with cast-lead sing-a-longs of ""God Bless America."" 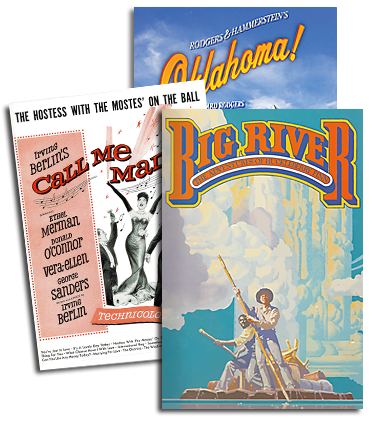 (Touring productions of Broadway musicals did the same in theaters across America; Michael Nouri, starring in South Pacific, made it his show's curtain call finale for the duration of the tour.) On that same Thursday night at the San Francisco Opera House, ""God Bless America"" was played by the orchestra, and followed by a moment of silence, before the evening's performance of RIGOLETTO. On Friday morning it was played by the U .S. Army Orchestra at the official service of remembrance at Washington's National Cathedral in the presence of President Bush and four former U.S. Presidents. That weekend it was heard in countless houses of worship across the land. That page was written by Irving Berlin. The story of ""God Bless America"" is emblematic of his life work and creed: simple yet eloquent, it is one man's fervent expression from the heart that somehow speaks for millions; a creation that could have rewarded its creator handsomely, except for his decision to donate all of its earnings to America, land that he loved. (See story, p. l.) Written towards the end of one world war, introduced on the eve of another, ""God Bless America"" has answered its nation's call yet again, seeking to soothe and assure a song of peace for a time of war. Musical theater historian Robert Kimball has, with Berlin's daughter Linda Emmet, co-edited THE COMPLETE LYRICS OF Irving Berlin (see p. 6, and last issue's cover story). In a Washington Post article which speculated that ""God Bless America"" may have, for the moment, surpassed even our national anthem in mass popularity, Kimball responded, ""in a funny way, 'God Bless America' is almost beyond the national anthem. It's always been reserved for very special occasions, and this is certainly one of them."" In USA Weekend, Emmet wrote of her father's song: ""'God Bless America' evokes a sense of unity and calm: 'Stand beside her and guide her through the night with a light from above.' What happened on September 11 could metaphorically be the night; the light could be our continuing to move on."" Leonard Slatkin, Music Director of the National Symphony Orchestra, told the Washington Post that the song ""seems to have struck the right tone for Americans because it operates somewhere between love of country and defense of country"" In the Wall Street Journal, Terry Teachout asked rhetorically, ""What makes us turn as if by instinct to 'God Bless America' in times of trial?"" He concluded it was the song's construction: ""The music's range is comfortable, the tune is deftly balanced,"" joined by ""smooth, evenly stressed lyrics."" In the New York Times, Stephen Holden called it ""a prime example of the kind of ageless perennial that [Berlin] could write better than any American songwriter. These perennials, much like prayers, offer a transcendent spiritual comfort."" In The New Criterion, John Simon noted that the song ""has everything uncomplicated patriotism, something about typography, a call for divine protection, an implied martial beat, and the confidence to set the climactic high note of the tune to the word 'God.' As a national song,"" he concluded, ""it's ingeniously, unobtrusively comprehensive."" Though the song is purely one man's expression of love and gratitude for his adopted country, its composer had to withstand charges that he imbued sacred beliefs with Tin Pan Alley sentiment. His response was assured and, in light of current events, remarkably prescient. ""There is a cynicism about flag-waving and patriotism until something happens,"" he noted in 1962. ""[Take] 'God Bless America,' for instance. It is simple, honest a patriotic statement. It's an emotion, not just words and music...A patriotic song is an emotion, and you must not embarrass an audience with it, or they'll hate your guts. It has to be right, and the time for it has to be right."" Berlin had an uncanny sense of timing, and could be brutually self-editing if a song or any portion of a song wasn't, in his estimation, right for the moment. In 1918, he was a private in the U.S. Army, stationed at Camp Upton on Long Island, and writing the score for an all-soldier revue, YIP, YIP, YAPHANK. It was a rousing pep rally of a show, and so the song he wrote for the finale, a heartfelt paean to his beloved country called ""God Bless America,"" didn't seem right. ""We weren't 'God-blessing America' at the time we were going to beat the Hun,"" he recalled, ""and I realized that the song was just a bit too much."" So, without hesitation, he filed it away in his ""trunk."" There it lay, untouched, for twenty years. In September 1938, Berlin now a master showman and internationally acclaimed celebrity was in London, attending the premiere of his film ALEXANDER'S RAGTIME BAND. But his joy was tempered by news reports of the Munich Conference, where Hitler's fast gains of power made a mockery of Neville Chamberlain's promise for ""peace in our time."" In a 1954 letter, quoted in THE COMPLETE LYRICS..., Berlin recounts his response to these ominous events. His apprehension for Europe's future had only magnified his gratitude to his own country: ""On my way back [to America], I tried to write a song that I felt at that time. I remember finishing a chorus of a song called 'Thanks America,' which I tore up because it was very bad. It seemed a bad editorial set to music."" He struggled with another attempt, ""Let's Talk About Liberty,"" before he remembered that song from Camp Upton: ""God Bless America,"" its title inspired by his own mother who, despite the impoverished conditions of the family's early years in this country, would frequently murmur those three words (""and not casually,"" Berlin recalled, ""but with emotion which was almost exaltation""). Taking a fresh look at it, Berlin knew that this song's time had come. But not, however, without a few key revisions. The original song was overtly martial in tone, as befitting the WWI era epitomized by George M. Cohan's spirited ""Over There!"" Berlin didn't want a war cry now he wanted a song of peace. The original lyric read in part, ""Stand beside her/And guide her/To the right with a light from above/Make her victorious on land and foam."" By 1938, ""to the right"" suggested extremism, even Fascism; in Berlin's mind, saber-rattling shouts of ""victory"" were equally inappropriate. He changed both lyrics, and reset the melody accordingly. He also composed a verse that directly acknowledged the challenges of the day: ""While the storm clouds gather/Far across the sea/Let us swear allegiance/To a land that's free..."" Now, Berlin was convinced, he had a song suitable for an anxious country at a troubled time. Armistice Day, 1938 20 years since the end of World War I. The popular singer Kate Smith had asked Berlin for a song she could introduce on her special nationwide radio broadcast that night; he gave her ""God Bless America."" Response to the song was instant, overwhelming, and almost uniformly enthusiastic. Smith continued to sing ""God Bless America"" every week on her radio program throughout the WWII years, and it became her signature song. She recorded a single which soared to the top of the charts, joined there by an equally successful cover version from Bing Crosby. By the spring of 1939, ""God Bless America"" was becoming a new anthem; Berlin's music company could barely keep up with the demand for sheet music and within its first year, over 500,000 copies were sold. It was sung at ballparks, at concerts, at religious services. Smith sang it at the New York World's Fair, and in a cameo performance for the film version of Berlin's all-soldier WWII show, THIS IS THE ARMY. By the summer of 1940, both the Democrats and Republicans were clamoring to feature the song at their presidential conventions; Berlin, keeping personal preferences to himself, declared the song above politics, so it was sung at both and at many political conventions thereafter (including the Republican Convention of Summer 2000, held in Kate Smith's hometown of Philadelphia. Inevitably the song's high profile attracted controversy: Some on the political spectrum dismissed it as jingoistic flag-waving, while a more insidious sentiment reasoned that as an immigrant, and a Jew, Berlin lacked the requisite pedigree of a ""real"" American to express love of country. Just as inevitably, the song's astounding popularity led to a groundswell of calls for it to replace ""The Star Spangled Banner"" as America's national anthem. No one was more opposed to that notion than the songwriter himself: ""We've got a good national anthem,"" he said bluntly. ""You can't have two."" Berlin was often asked to sing ""God Bless America,"" and did at countless performances of THIS IS THE ARMY on Broadway, across America, and in the European and Pacific war theaters; on radio and TV appearances; and at patriotic rallies. In 1954, President Eisenhower presented him with a Congressional Medal of Honor in recognition of the song. In 1968, on a star-studded 80th birthday salute to Berlin on THE ED SULLIVAN SHOW, the honoree himself performed ""God Bless America"" as the evening's penultimate number, flanked by a chorus of Girl Scouts and Boy Scouts. (""He sang it beautifully"" Mary Ellin Barren recalls in her book,Irving Berlin: A DAUGHTER'S MEMOIR. ""A whole lifetime going into that frail but still true delivery."") In 1974, aged 86, Berlin sang it at a White House dinner honoring Vietnam War P.O.W's. It was his last public appearance. Of her father's devotion to the song, Mary Ellin Barren explained, ""it was the land he loved. It was his home sweet home. He, the immigrant who had made good, was saying thank you."" And of that land, which embraced his song anew in the first, tumultuous year of the 21st century, Linda Em met wrote in USA Weekend: ""I know my father would be proud that, to this day, his song still stirs and bonds us...I think people 100 or 200 years from now will still be singing it."" Certainly, that would have been the songwriter's wish. ""All that I hope for `God Bless America',"" said Berlin in 1940, ""is that it will continue to be popular, especially in these days when so many people feel a need for some vocal expression of their patriotism."" ""God Bless America"" is owned by The God Bless America Fund, and all royalties generated by the song go to that charity. Numerous recordings of the song are currently available (see ""For the Record, "" p. 3), and more than 70 different arrangements of the song exist for solo voices, choruses, bands, string orchestras, full orchestras, piano and more. Visit the website of the Hal Leonard Corporation www.halleonard.com for more information. In late 2001, a bill was introduced on the floor of the US House of Representatives to designate ""God Bless America"" as ""the national hymn of the United States""; that bill is presently before committee.